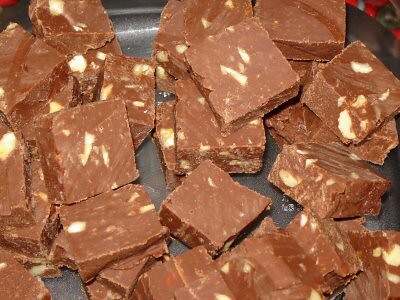 This is the most balanced, easy-to-eat fudge recipe I’ve ever made. The perfect amount of sweetness, creaminess, crunchy nuts, and chocolate decadence. It was a big hit at our Christmas party! 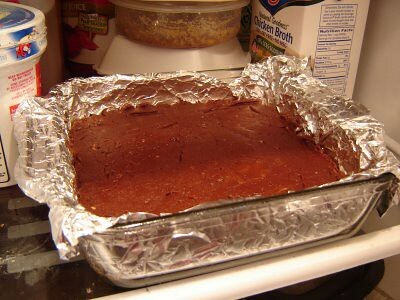 Line an 8 x 8″ pan with aluminum foil. Spray lightly with Pam and set aside. In a large saucepan over medium heat, combine marshmallow cream, sugar, evaporated milk, butter and salt. Bring to a full rolling boil and cook for 5 minutes, stirring constantly. Mixture will thicken slightly and turn a light caramel color. Remove mixture from heat and add chocolate chips. 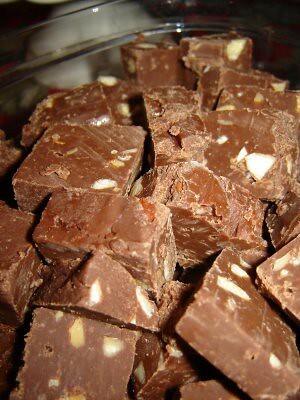 Stir until all chocolate is melted and mixture is smooth. 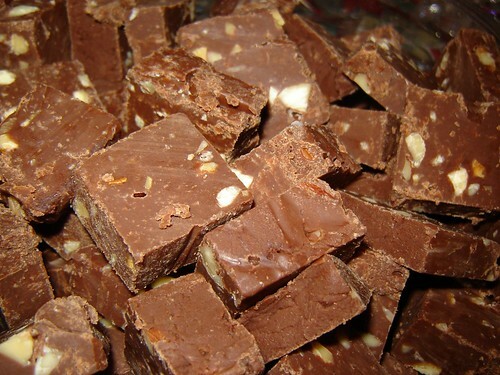 Stir in nuts and vanilla. Pour into prepared pan and smooth top with spatula. Chill in refrigerator for 2 hours or until firm. Slice into pieces and enjoy! And here it is sliced into bite-sized pieces! This recipe keeps fresh for several days in an airtight container, making it great for shipping in care packages or for making ahead of time for parties or gifts!